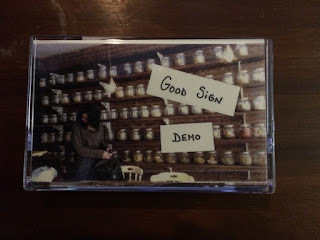 Good Sign delivers the pop punk goods in the vein of early Superchunk and Versus, an indie snack for the nibbly passerby. The Portland trio barely hits the seven-minute mark on their demo, but it sounds like they’re having an awfully good time. Features members of In Flux, Congratulations, Taurean, Alien Boy, and Perfume V, among others. Whoever names their band after a Pavement song/lyric is OK in my book. Mine in college was called Dance Faction. Shruggity shrug shrug? Hard not to crack a smile while listening to these four tunes. Have a blast, rockers.